The history of the rent strike in the UK is a colourful and rich one. It is a history of the council estate, of the modern university campus and of the private tenant. It is a history of struggle, of glimmers of hope amongst the dark history of capitalism, extraordinary tales of solidarity and perhaps most importantly, proof that rent strikes can work. Organisers of current rent strikes would do well to learn from historical precedents—here drawn from British history, although rent strikes elsewhere around the globe are similarly inspiring and informative—and draw experience from these events to inform the organisation of their own strikes. The earliest instance of a British rent strike known as of the writing of this handbook dates back to the 19th century when workers involved in the Great Dock Strike of 1889 withheld their rent in the ongoing battle against dangerous working conditions, precarious employment and low pay. The rent strike was among many factors which lead to the dock workers winning the strike and forming a new and better trade union. In 1915, women in Glasgow, organised by Mary Barbour, went on rent strike to protest the 25% rent increases proposed by private landlords, physically resisting bailiffs with force and marching to demand the release of imprisoned strikers. When the news reached Lloyd George’s wartime government, rent freezes were implemented, the first time the government had intervened in rent controls in the private sector. The 1930s saw rent strikes occur in Leeds, organised by the Leeds Tenant Federation, and in the East End of London. In 1958 tenants St Pancras London set up United Tenants’ Association (UTA), which organised marches, meetings with councillors, a 16,000 person-strong petition and, when these were ignored, rent strikes against the proposed rent hikes. Tensions rose, involving riots and demonstrations, until in July 1960, when bailiffs forced through the flats while renters defended their homes room by room, as outside fighting between workers and police lasted long after evictions. The Public Order Act of 1936 was evoked the next day, banning all demonstrations, and this rent strike ended in defeat. 1968 to 1973 saw a number of rent strikes organised, with varying degrees of success, by private tenants. The withholding of rent of 11,000 London households, along with lobbying and demonstrations lead to the passing of legislation limiting rent rises. Over 80 rent strikes and tenant protests took place across the country, and one in Kirby, Liverpool lasted for 14 months, unfortunately ending after members were put in prison and arrested. 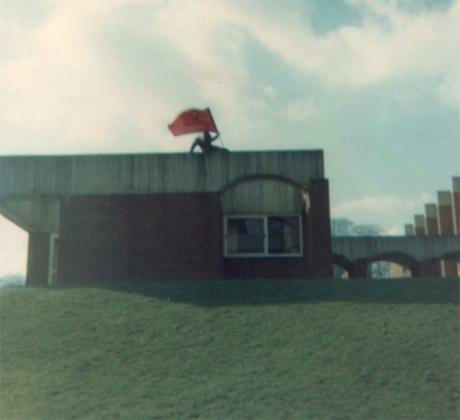 Students at the University of Sussex went on rent strike on numerous occasions between the years 1972 and 1985, the more successful of these occurring in the first two years. In 1972, 77% of the campus population went on rent strike to protest increased rents and the building of yet more inadequately built accommodation without consultation from the students. Students withheld a total of £35,000 for fifteen weeks, and managed to stop the building of the new hall of residence and lower the rent increase from 6.5% to 3.5%. The next year, students went on rent strike as part of the nation-wide protest to the drop in real-term value of their grants, which saw rent strikes organised across 44 universities. Two-thirds of students paid money into the USTA strike account and the university promised to not raise rents for next year, and students eventually won a 25% increase in grants. Rent strikes continued to gain traction after the success of 1973. In response to rent increases in accommodation at University of Warwick in 1987, the Union organised two weeks of direct action, during which over 80 percent of those affected paid into a Union strike fund, withholding around £112,000. In response management withheld the union’s grant, took out an injunction against protesters and brought in the police and surveillance cameras. Eventually the injunction was dropped and half-rents were secured although rents continued to rise. This is by no means a conclusive account of the history of rent strikes, the links below will prove useful for those interested in its history. Rent strikes are also by no means limited to the UK, and events like the New York Anti-Rent War and the Barcelona rent strike also make for some fascinating and instructive reading.